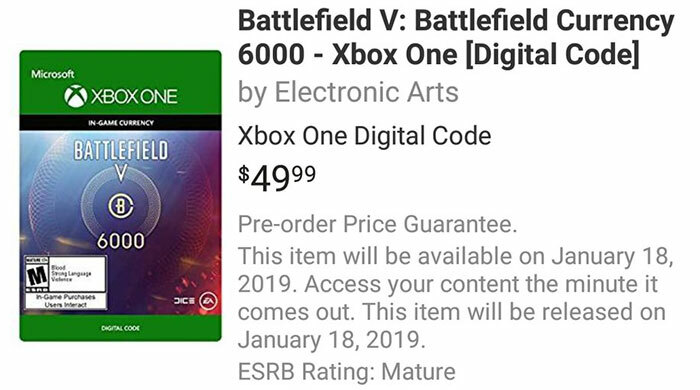 According to an Amazon US listing, since deleted, EA will begin the monetisation of Battlefield V via microtransactions starting from 18th January 2019. TweakTown spotted the listing, probably via Redditor Spanky088, who captured most of the important data about the in-game currency, what it can purchase, and the exchange rate from real-money. EA and DICE chose not to monetise Battlefield V at launch, swerving any review criticism that might have come about due to its implementation. Back in April EA claimed that it had learned from the Star Wars Battlefront II loot box debacle and it obviously didn't want its latest Battlefield title to be put in the shadow by similar business practices. Will Battlefield V need to be reviewed again after the 18th January? From the source report, one would think not. It is claimed that the BCoins will be priced similarly to Battlefront II's crystals, and be only useful for optional cosmetic items to customize characters in the Company hub. 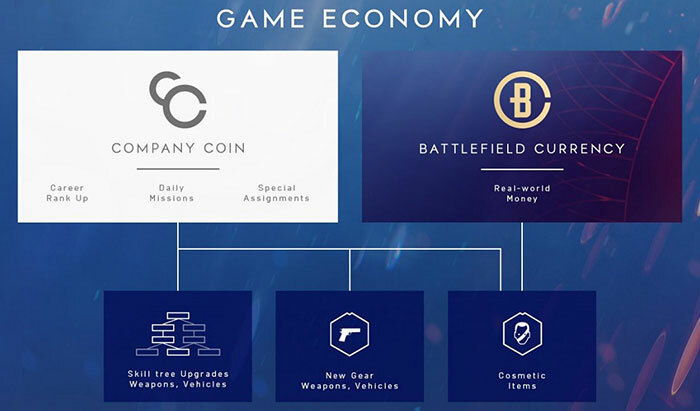 A graphic showing the game economy seems to confirm that BCoins are cosmetic only, while the Company Coins (CCoins) that you earn by playing can be used for more important game upgrades. As a reminder, Battlefield V is still early in its 'journey' through WWII. A second chapter dubbed Lightning Strikes begins in January, and those awaiting the Firestorm Battle Royale mode will have to wait until March to indulge as a subsequent chapter begins. EA shareholders have had a tough few months as the firm's stock has fallen about 50 per cent from its highs this summer. Hopefully being able to implement microtransactions, without offending the gaming public and their moral guardians, will give the company a lift. don't be naive…it's like me saying I'll go with your g/friend to Ibiza but don't worry because we won't do anything naughty. …it's only downhill (not fun kind) from there. and just to add I'm a battlefield player too…but EA is certainly getting greedy to the point of loosing perspective of what's good for the players / customers. EA never learns, do they ? You just look like a weirdo not taking part. Microtransactions are here to stay and no one can change that, especially for a multiplayer only game. This is the lesser of two evils.